Phew!! It’s been hot this week hasn’t it?!! I love the sun, it makes everyone happy. Everything seems to calm down and relax a little and people seem to be friendlier. That is until they get to work and have to sit for 8 hours in a sweaty grumpy office where people fight over windows and fans, hoping that management will fork out for an air conditioning system. In my office its the complete opposite. We have a massive air conditioning unit which has 3 settings – cold, freezing and arctic. The problem is everyone in our office seems to have different body temperatures ranging from ‘phew its warm in here’ to ‘I need my jumper its bloody freezing’. So I guess the problem is partly my fault because I feel the cold too much! I know what you are thinking, (unless you are in the same position as me), stop complaining at least you have air con! Well I say tell that to the penguin that hangs out under my desk!! 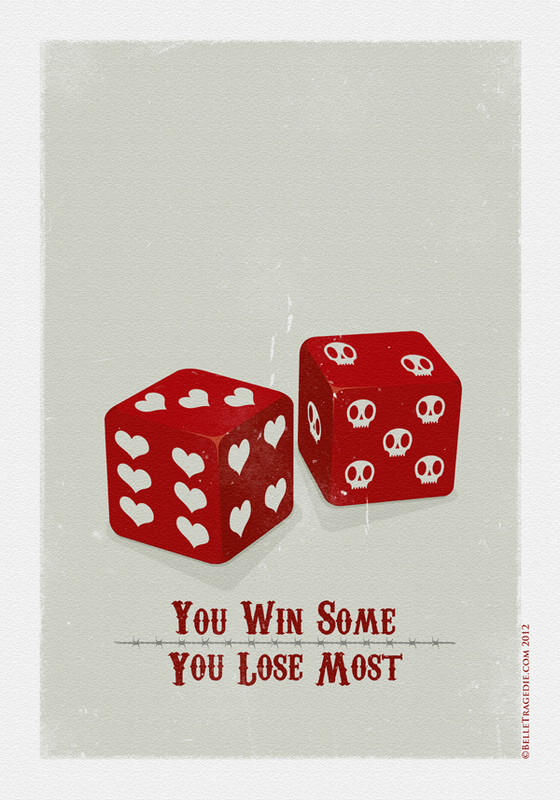 Okay enough about temperature, here is my latest illustration titled “You Win Some, You Lose Most.” Fairly self explanatory really, although a little darker under the surface depending on how you interpret it. I think it’s quite fitting for the situation the country is in at the moment, or the whole world even. Here you will find information about new work & projects I'm working on, general ramblings of what I've been up to and any inspiration that I feel I have to shout about.